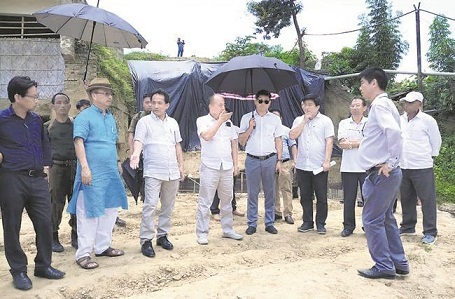 The committee on government assurances of the Nagaland Legislative Assembly (NLA), which conducted spot verification of the construction of bridge between Purana Bazar and Walford in Dimapur on June 25, 2018, has been assured that the bridge would be completed by December next year. A statement issued by NLA secretariat stated that the spot verification was carried out by the committee led by its chairman, Dr Chotisuh Sazo, MLA along with Dr Imtiwapang Aier, MLA; YM Yollow, MLA; L Khuimo Khiamniungan, MLA; Mhathung Yantha, MLA & advisor horticulture; H Khehovi, MLA & advisor, Tourism, Art & Culture; Toshi Wungtung, MLA & advisor, I&PR, SCERT & village guards. They were accompanied by N Benjamin Newmai, Commissioner & Secretary and officers of NLA. The director of Urban Development with engineers and officials of the department received the members of the committee at Circuit House, Dimapur. The committee was briefed that although the initial work order was issued on February 16, 2010, the work could resume only in the year 2017 due to various reasons like objection from BRO, court cases etc. However, the committee was also apprised of various works under progress such as completion of pile foundation 3 piers; cable suspension bridge; reconstruction of two pile caps; three mid piers; piling work for the abutment wall and near completion of retaining wall. The committee while expressing satisfaction, encouraged the department to give all out effort to complete the project within the stipulated time of December 2019. The committee also requested the department to try implementing its observation such as requirement of strengthening the cable suspension bridge for pedestrian safety or restrict usage completely and enhance the river training from 50 metre to at least 200 metre.